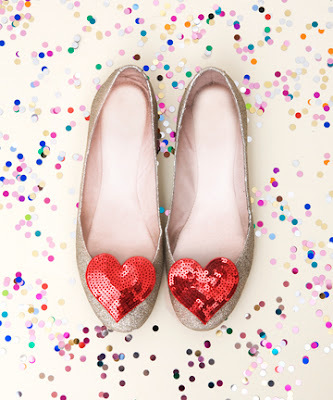 Jackie Fo: Glitter, Sparkles and Hearts - Oh My! I love learning about new fantastic websites, although frankly, my list of visited sites has gotten slightly out of control. You might say I'm a website/blog hoarder, which isn't as bad as being a psychical hoarder. Although if I'm being REALLY, TRULY honest, I tend to hoard magazines and cookbooks too. But that's besides the point. Let's talk about this new website one of my brides introduced me to, BAN.DO. Ban.Do is filled with fun, glittery accessories that just scream girly celebrations. Let's take a peek into this fabulous sparkly world. These glitter heart shoe clips are perfect for glitzy weddings that celebrate all things from the heart! Forgo the traditional floral corsage for your honored guests and use this ostrich feather brooch that comes in several colors. Can you say Great Gatsby themed Roaring Twenties wedding?! I love bows like you wouldn't believe. I'm in love with this bow headpiece for a fun, creative bride that's not wearing a traditional veil. Oooh...or this flower child headpiece is a fantastic statement for the uber fashionable bride. 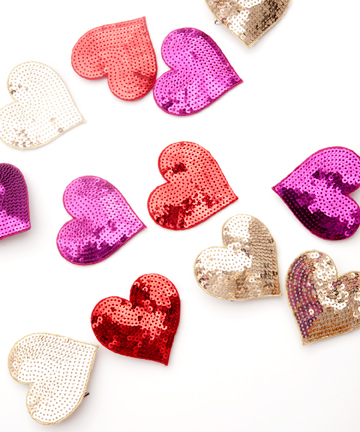 Use these heart pins for party favors, honored guest brooches or just good ole sparkly decoration! Stay up with all the sparkly goodness at Ban.Do's blog! I hope this glimpse of glitter has brightened up your day added to your internet hoarding stash! Great accessories! My favorites are definitely the heart shoe clips. They could go so many other places too!